Before this week the last live stadium concert I went to was sometime in the 80s (yes, I am old). I don’t remember what it was at this stage but I do remember it was not enjoyable. I was on the ground floor and couldn’t see a thing. I think after that last concert I wrote them off as something I just didn’t enjoy. Not that I quit listening to live music. I did still go to small shows in clubs, theatres and to outdoor events (outdoor events are far more enjoyable for me). But I didn’t go to another stadium concert despite being asked by my family to go with them (my husband loves live shows and took the kids to a long list of concerts including, Train, Maroon 5, Three Days Grace, Owl City, Simple Plan, Mariana’s Trench, Neon Trees, Trooper, Journey, Kings of Leon, Chicago … the list goes on and on). Some decent musical talent in that list but … no I insisted I didn’t go to concerts. So my plan when we booked our trip to Oregon, was that I would skip the Bruno Mars show. I don’t do concerts. But my husband had bought four tickets thinking our eldest son would be with us. Unfortunately, Bobby (who is a musician in his own right) had to stay home due to work commitments so we had an extra ticket. The pressure began for me to go to the show. Still I was adamant that I would not go to a concert. I hated them. I wanted to stay at the hotel the night of the show and write! I had work to do after all. My daughter, Caitie, was the one who talked me into giving Bruno’s show a go. I was reluctant right up until we got into the venue. A basketball stadium. And our seats were high up almost behind the stage. My husband had worried about this when I agreed to go to the show. The morning before I caught him trolling through ticket sites looking for better seats. I told him that was a waste of money – after all one goes to concerts to LISTEN to the music not see what’s happening on stage (I did mentioned that it had been over 30 years since I’d been to a concert). The open act (Nico & Vinz) was good but they kept grabbing their crotches (which made me wonder if they had to use the bathroom facilities the entire time – it was distracting in a way I don’t think they meant it to be). And they only played a few songs (they were very good actually, I would have listened to them longer). After the opening act, there was a loooong break. As in almost an hour long. During which they played crappy canned rap-like music (I hate rap-like music). At this stage the whole experience was ranking a 1/5 for me and I was ready to go back to the hotel without seeing Bruno and doing some writing. When Bruno Mars finally hit the stage (a half hour late – just enough time for the 8 drunk women in front of us to provide me with a bit of fodder for my next book), I was bored, annoyed and really wished I’d stood in line for a glass of wine while I had the chance. But all my annoyance disappeared in about 3 seconds. The show was amazing. Bruno Mars is actually better live than his recordings, which is saying a lot. And he’s a true entertainer. His entire band was amazing! I don’t even know half his songs but I enjoyed every single song he played. So was it all rainbows and unicorns … um, not exactly. For me the stadium concert experience still majorly sucked. 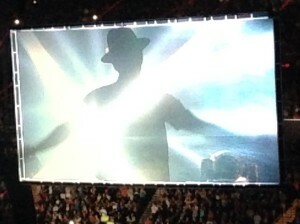 Bruno Mars has an amazing range and such an incredible voice. But the young women behind us (who clearly know NOTHING about music) insisted in shrieking at the top of their lungs right when he was hitting the most intricate combination of notes utterly drowning him out and ruining the experience for me. Would I see Bruno Mars live again? Given the chance, absolutely! But I’d rather do so in more intimate setting – a small theatre or, ideally, a pub-like atmosphere. The stadium concerts are not for me. But in the end I would give Bruno’s concert at 5/5 (and I’m a hard marker). If you get a chance to see him live – do it!